Different brands and types of flour absorb different amounts of water. If you use bread flour in place of all-purpose flour, or if you add stone ground whole wheat to your dough, you have to be prepared to adjust the amount of water you use when making bread. When you are working with wheat flour, you’d be wise to become familiar with the concept of flour absorption. The absorbency of flour varies from grain to grain and from season to season. The same brand of wheat flour may absorb more or less water depending on the moisture in your kitchen or where the flour was stored. The photo above shows flour absorption in action. We combined the same about of two different types of flour with the same amount of water. On the left is a French-style high extraction flour mixed with 3 ½ ounces of water. (High-extraction flour is a finely ground flour that has some of the bran removed so it is like a cross between a whole wheat and a white flour. ) On the right is all-purpose flour mixed with with 3 ½ ounces of water. Can you see how firm and dry the dough made with high-extraction flour is? It’s dense and unworkable. 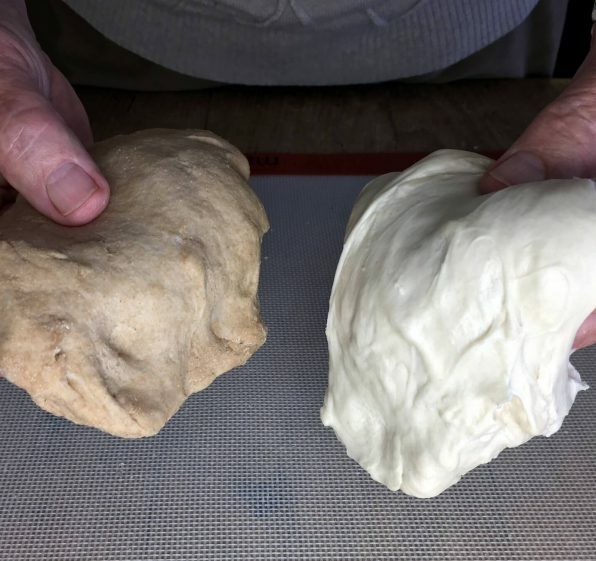 Look at the dough on the right made with all-purpose flour. It is soft, supple and quite sticky. Here are a few simple things to keep in mind concerning flour absorption. • Higher protein flour absorbs more water than lower protein flour. This means that a recipe that calls for bread flour may require more water than one that uses all-purpose flour. • Stone ground flours absorb less water than conventionally ground flour. • If your bread dough seems really sticky or dry and tough, check the flour. You may have used the wrong type for the recipe. Or the brand of flour you used may have a higher (lower) protein content than what you’re accustomed to using. I’ve seen students struggling in bread class because they didn’t read the label on the flour bin. (Or they didn’t read the recipe carefully.) They swoop in and scoop flour from the closest bin in their rush to start mixing their bread dough. • Measuring your flour and other ingredients has a major impact too. • When experimenting with a new type of flour, be prepared to add more water or a bit more flour to your dough to accommodate the variations. Record the changes you made to your recipe for your next batch of bread.